P2 Volume Gloss 300 Party President | Light Your Nails! Questa sera vi mostro uno degli arrivi recenti nella linea Volume Gloss di P2 Cosmetics, brand austriaco approdato in Italia da circa un anno. Quello che vi faccio vedere è il n. 300 Party President, una bella lacca rosa Barbie. Il colore è davvero una meraviglia, ed asciuga lucidissimo come da promessa. Personalmente non sono una grande fan del pennello della linea Volume Gloss, e non capisco perchè P2 abbia pennelli diversi per ciascuna delle proprie linee. A parte questo, che è gusto assolutamente personale, lo smalto è ottimo. 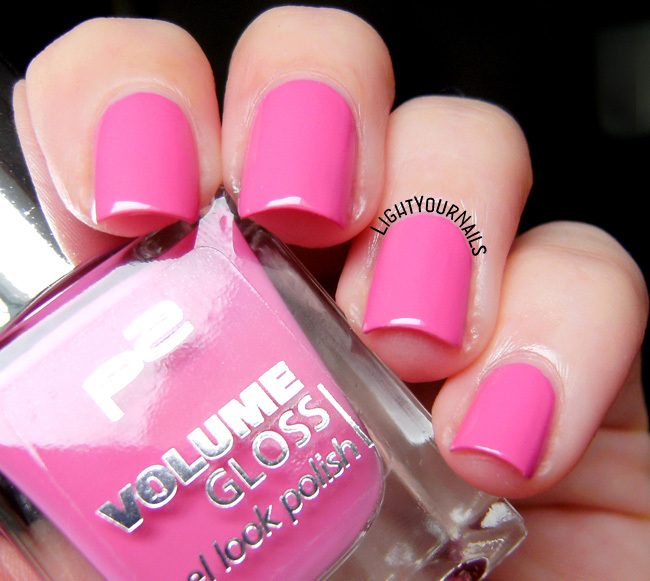 Today I am showing you a nail polish that was recently added to the P2 Cosmetics Volume Gloss range. P2 Cosmetics is an Austrian brand that landed to Italian stores last year but is very popular already. This is n. 300 Party President, a lovely Barbie pink creme. Colour is awesome, and it dries super shiny as it promises. Personally I’m no fan of Volume Gloss range brushes, I can’t understand why P2 has different brushes for each of their lines. Other that this, which is absolutely personal, this nail polish is really good. Potete trovare gli smalti e i cosmetici P2 presso i negozi OVS e Upim selezionati. Il prezzo degli smalti Volume Gloss in particolare è di € 2,99 per 12ml. Che dite? Vi piace? Avete già trovato e provato i prodotti P2 Cosmetics? P2 Cosmetics nail polishes are very wallet-friendly, gotta love that! Have you ever heard or tried this brand? And what about this shade? I love this P2 collection a lot. This shade is super pretty! This shade of pink is definitely made for you! Gorgeous! Thank you Cheyenne! I think it's only available across Europe at the moment. This shade is beautiful, and the polish is so glossy without topcoat. Great swatch. I dunno about "plump" but yeah...this is a hot color. Haha, I can relate, my kitchen is an eggplant purple! I love this color!! I always love a good bubble gum pink! Thanks! I think P2 is only available across Europe yet. Such a pretty shade! I love how glossy it is. So perfect! I love this classic pink!